Club Doncaster Foundation’s health and wellbeing programme Fit Rovers has claimed another prize for encouraging people to get on their bike during Cycle September. 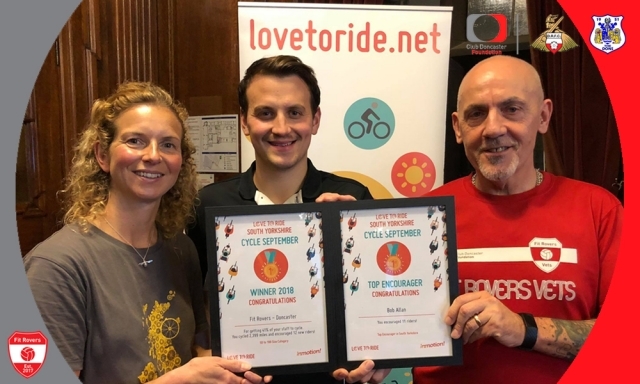 The Love to Ride UK celebration event, held at Sheffield Town Hall, on November 13, highlighted the achievement of organisations and participants who have gone on to achieve fantastic results through cycling. Fit Rovers were voted September 2018 winners in the 50-199 participants category, after 41 per cent of its participants cycled during the month, cycling 2,399 miles and encouraging 12 new riders. Fit Rovers graduate and Club Doncaster Foundation volunteer Bob Allan was recognised as the top encourager in South Yorkshire, after pushing 11 people to get back on their bikes during September. Health and wellbeing officer Scott Copeland said: “The Cycle September celebration event was a fantastic way to recognise the efforts of our participants during this challenge. “One of our participants, John Paul Watters, was ranked in the top 10 for the number of journeys made by bike in that month and Fit Rovers volunteer Bob Allan was the number one encourager in South Yorkshire. Love to Ride UK has partnered with more than 1000 organisations during Cycle September, which saw 18,823 participants get involved in cycling, logging more than 250,000 trips. For anyone wanting to get into cycling or learn more about other opportunities the Foundation are able to offer through oa partnership with Doncaster Council, please contact Scott Copeland on 01302 764663.